Actually Deployed On Polling Booths/Counting Centres. If same Micro-Observer is deployed for polling day as well as on counting day, it will be treated as seperate duty and remuneration will be paid accordingly. 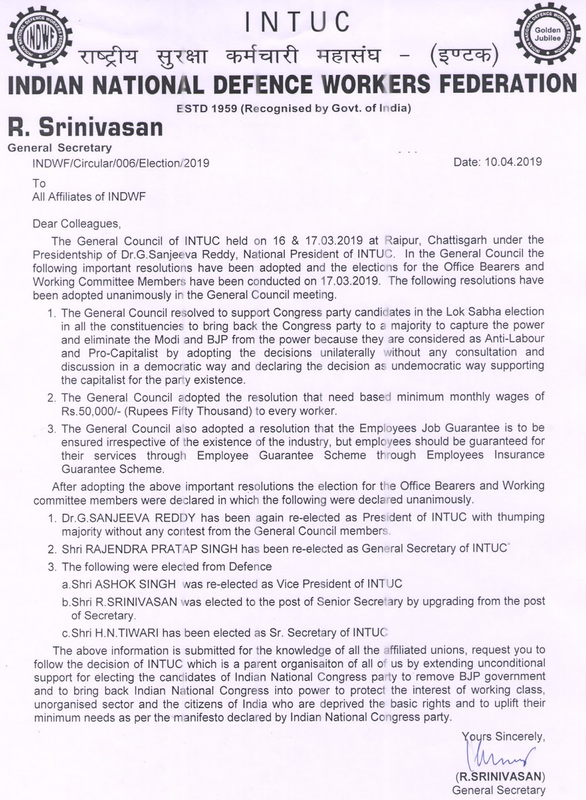 The General Council of INTUC held on 16 and 17th March 2019 at Raipur, Chattisgarh under the President of Dr.G.Sanjeeva Reddy, National Presidnet of INTUC. The General Council decided to support Congress Party Candidates in Lok Sabha Election. The General Council of INTUC held on 16 & 17.03.2019 at Raipur, Chattisgarh under the Presidentship of Dr.G. Sanjeeva Reddy, National President of INTUC. In the General Council the following important resolutions have been adopted and the elections foe the Office Bearers and Working Committee Members have been conducted on 17.03.2019. The following resolutions have been adopted unanimously in the General Council meeting. 1. The General Council resolved to support Congress party candidates in the Lok Sabha election in all the constituencies to bring back the Congress party to a majority to capture the power and eliminate the Modi and BJP from the power because they are considered as Anti-Labour and Pro-Capitalist by adopting the decisions unilaterally without any consultation and discussion in a democratic way and declaring the decision as undemocratic way supporting the capitalist for the party existence. 2. General Council adopted the resolution that need based minimum monthly wages of Rs.50,000/- (Rupees Fifty Thousand) to every worker. 3. The General Council also adopted a resolution that the Employees Job Guarantee is to be ensured irrespective of the existence of the industry, but employees should be guaranteed for their services through Employees Guarantee Scheme through Employees Insurance Guarantee Scheme. After adopting the above important resolutions the election for the Office Bearers and Working committee members were declared in which the following were declared unanimously. 1.Dr. G. SANJEEVA REDDY has been again re-elected as President of INTUC with thumping majority without any contest from the General Council members. b. Shri R. SRINIVASAN was elected to the post Senior Secretary by upgrading from the post of Secretary. The above information is submitted for the knowledge of all the affiliated unions, request you to follow the decision of INTUC which is a parent organization of all of us by extending unconditional support for electing the candidates of Indian National Congress into power to protect the Interest of working class, unorganized sector and the citizens of India who are deprived the basic rights and to uplift their minimum needs as per the manifesto declared by Indian National Congress party. Similary all the Collectors and District Election Officers are authrorized to declare a local holiday on the day fixed for counring i.e., on 23.05.2019 (Thrusday), if necessary. declared as holiday on the eve of Bathukamma starting day) as Court Working Day to the High Court of Andhra Pradesh. India votes in the first phase of General elections-2019 on Wednesday, 11th April. 91 out of 543 Lok Sabha constituencies are in the fray in this round. The other states going to polls in the first phase include – Assam, Bihar, Chhattisgarh, Jammu and Kashmir, Maharashtra, Manipur, Odisha, Tripura, Uttar Pradesh and West Bengal. In these states, votes will be cast for some of the constituencies in the first phase of general elections. Voting from 2nd to 7th phase of elections will take place on April 18, April 23, April 29, May 6, May 12 and May 19. The counting of votes for the 17th Lok sabha will take place on 23rd May. Election Commissioner Shri Ashok Lavasa pointed out that today’s has been a momentous meeting for evolution of ‘behaviour’ of Social Media platforms on Social Media. He said that voluntary restraint is a hallmark of civilized society and works as effectively as any regulation. He suggested that a clear clause on users’ voluntarily agreeing not to misuse social media platforms for election or political purposes should be considered by the management. Today’s meeting was attended by the industry head Internet and Mobile Association of India (IAMAI) and representatives from social media organizations such as Facebook, Whatsapp, Twitter, Google, ShareChat, TikTok and BigoTV.